Detailed analysis of the UK referendum vote in favour of leaving the European Union. Or was it that this is the story of a sizeable enough, but still minority of the working class, with reactionary ideas being energized and mobilized by the toxic racist nationalism of the English colonial project. Essentially a whipping up of all those older racist relatives that turn up at family events and that everyone wishes would just shut up? Something like Donald Trump has managed to do, using similar rhetoric about migrants and elites, in the USA, ‘Take our Country Back’ could well be a Trump slogan, ‘Make Britain Great Again’ could well have been the Leave slogan. From anecdotal stories, geographic voting and most importantly actual polling of 12,000 voters it becomes clear that these communities, who were smashed by neoliberalism from Thatcher to Blair, were successfully tricked into taking aim at the wrong target in order to ‘take our country back’. But it goes deeper than trickery, the poll results make clear that many of the Leave voters hold a toxic blend of reactionary views, glued together by the common cement of English colonialist nationalism. And ‘English’ is the correct term, one fascinating aspect of one voter survey is that 79% of Leave voters identify as English rather than British, while 60% of Remain votes identified as British not English. We can dig into the motivations of those who voted further because of polling of 12,000 people who had voted by Lord Ashcroft Polls. Michael Ashcroft is an interesting character, the former Deputy Chairman of the Conservative Party and the 74th richest man in Britain, the Sunday Times reckons he was worth 1.32 billion in 2015. The polling seems to be part hobby, part philanthropy, or as he puts it “if it doesn’t sound too pompous, there is an element of public service in keeping politicians on their toes”. He is pro Brexit so the damning nature of some of what follows isn’t a result of bias against Leave voters since he is one. In any case it’s frequently the case that after an election or referendum you wish you had information about who voted which way and why they did so. Endless arguments go on based on people’s presumptions about this. Ashcroft did us a huge favour. “On referendum day I surveyed 12,369 people after they had voted to help explain the result.” Political parties do this sort of polling all the time but seldom release results unless they can make particularly favourable stories out of them. And this isn’t a favourable story. The first interesting finding is the breakdown of Leave votes by class. Definitions of who belongs in what class are enormously controversial and could be fought over all day. Left groups tend to use the term working class in both a broad sense that includes almost everyone (if they are trying to recruit you) and in a narrow sense (if they want to denounce you). We’d offer the health warning that we are not so keen on the classification Ashcroft uses. But it’s way better than nothing. He uses the 50 year old NRS system, a common market research classification. NRS standing for National Readership Survey at its origins lie in advertisers’ desire to know what sort of people read different publications in order to crudely target their advertising on that basis. Broadsheets often boast of having a high ABC1 readership to attract high value advertising as that segment has much greater disposable income. The NRS class classification system is flawed, apart from anything else the ruling class are invisible in it, presumably because although the power and wealth of that group is enormous their numbers are too few to make a distinct division worthwhile. The classification being 50 years old is rather tied to old ideas about the relative merits of manual labour and desk jobs, desk jobs are middle class as it appears are retail and service workers. In other words, if you took the working class / middle class labels of the CRS system at face value then, for this poll, voters in the UK referendum were 33% working class, 67% middle class with no ruling/capitalist class, not even as the often over stated 1%. These figures are partially so low because voting is always disproportionately dominated by ABC1s with relatively larger numbers of C2DEs staying at home. The C2DE composition in the UK population is considerably higher than in the vote poll, the NRS classification in 2015 gave 46% in their C2DE definition of working class and 54% as middle class. Instead we would work off looking at whether people have to make a living through working for others (the working class), have enough skills, tools and space to independently work for themselves (the middle class) or have so much wealth that most of their income comes from having the rest of us work for them. For the UK that would give you more of a 80%+ working class, 20%- middle class and 1%- ruling class, with the actual section of that class that rules being more like the top 0.01%. But in any case what the Ashcroft polling tells us is that for the C2DE categories, which are working class by any definition, 64% of those who voted chose Leave. This is way ahead of the national average of 51.9% for Leave. What was the turnout of C2DE voters? Voter turnout was around 72%, differing a bit by region. But as we already recognised, voter participation is not equal across classes, far more ABC1s vote than C2Des, arguably because the C2DEs understand that politicians in power only listen to the As. So we can be fairly sure less than 72% of C2DEs voted, the question is how much less. The Ashcroft poll enables us to make a good guess at this. C2DEs are 46% of the UK population but only 33% of the Ashcroft poll, that missing 13% indicates the scale of the higher non-voting rate. Using that gap a reasonable quick estimate would be that turnout for C2DE was possibly slightly less than 52% of those registered. (Ben Pritchett did some proper maths on this ) But we also need to do a few final subtractions. The first is of people entitled to vote but not registered, that number I haven’t been able to estimate but it’s probably not huge. The second is those not yet of voting age, who I’m going to ignore beyond noting that because the young overwhelmingly voted Remain it’s probably the case that most of these would have been Remain. The third subtraction is far more politically important: migrants who were not from the former colonies (the Commonwealth and Ireland) and who therefore did not get a vote. In terms of migrants from other areas of the EU that’s over 2 million people excluded from the vote – a shocking figure when you consider the vote was essentially on their future. And migrants not from the Commonwealth or Ireland also number in the hundreds of thousands. Remember less than 1.3 million votes separated Leave from Remain, if the 2.5 million plus migrants had been allowed to vote on their own future Brexit probably would not have happened. It’s an important aside, and the point to make here is that these migrants are overwhelmingly working class and therefore their exclusion from the vote reduces further the proportion of the C2DE working class that actually voted leave. How many C2DE working class Leave voters were there? Some very crude maths now. The population of the UK at the time of the last census was 63 million. If 46% were C2DEs this gives about 30 million people, about 23% of whom were below voting age, so about 22 million. From this we need to subtract the C2DE immigrants who can’t vote, let’s guess about 1 million people. Of the 21 million remaining we’ve worked out above that about half voted, so 10.5 million, or 1/3 of the total voters. Out of that the Ashcroft poll suggests 64% voted Leave, that’s 6.7 million people. 6.7 million is also about 39% of the total Leave vote. As the Leave vote totaled 17.4 million we see Leave was also mostly ABC1s even though it captured almost 2/3 of voting C2DEs. I wanted to do these calculations because it’s going to become clear that the many Leave voters are pretty damn reactionary and not just on migration. And a section of the left that foolishly advocated a left Leave vote are now defensively trying to exaggerate the ‘working class’ composition of the Leave vote as a form of strange self-justification. The reality is that a significant section of the white English working class buys into English colonial nationalism and has backed some terrible right wing figures from Enoch Powell to Margaret Thatcher as part of that. The core of the C2DE Leave vote seems to be an expression of that bloc, not an expression of the C2DE working class as a whole. The relatively high percentage of C2DE voters voting Leave (64%) is as much because the campaign mobilised those hostile to migrants whereas there would be few C2DEs with any love for the EU. From the calculations above we see that even if we restrict the working class to C2DEs, only 23% of the C2DE working class actually mobilised to tick Leave. If we exclude those too young to vote that rises to about 32%. So, for a variety of reasons, including being denied a vote, 68% of the C2DE working class of voting age did not vote Leave. We’d speculate that amongst that number are a substantial amount who were horrified by the racist nonsense of their neighbors and relatives but who were not going to save the establishment by voting Remain. Perhaps a major motivation for the 18% who did vote Remain was opposing those racist neighbours, in particular as that 18% was probably drawn from the sizeable number of C2DEs that are not white. Even of those C2DEs who were allowed to and did vote, some working class areas of London, for instance Tottenham and Walthamstow, voted overwhelmingly for Remain. The same may well be true of Scotland, and some of the bigger cities of the UK. From the referendum returns it appears the Leave C2DE vote was concentrated in smaller cities, towns and villages, and the further out suburbs. What was the ‘working class’ Leave vote? When you compare his data with the geographical results it becomes clear that the huge working class Leave vote was a citizen white C2DE working class from those areas that have been decimated by neoliberalism, in particular the once industrial and mining north of England and Wales and the agricultural counties of the south. Of course the north of England and Wales have comparatively fewer migrants than in Remain-voting London because there aren’t that that many available jobs. This maps onto a common observation that in electoral terms the far right tends to do well in areas where there are not actually as many migrants as the areas they do badly in. Its racist fear rather than reality that garners them support. In the agricultural south, a much grimmer story is found as agricultural work is sometimes dominated by gangster capitalists with groups of insecure migrants under illegal pay and conditions under their control. This is typical of agricultural work in the wealthier countries where regardless of migration controls the state allows situations that create pools of very cheap insecure labour with raids and deportations serving to maintain that insecurity and prevent organising. So what has caused a large enough section of the C2DE working class to scapegoat migrants in the process of siding with one particular gang of rich white neoliberals? Yes there is competition for jobs & houses but not only is the scarcity that creates competition a product of capitalism it’s also the case that the worst racism is not found in the areas where there is greatest competition. Housing is at its most expensive in Leave voting London, costs are not only lower in the old industrial zones but in many cases there is a large amount of empty housing stock visually demonstrating that a shortage of decent housing is not down to a lack of buildings. So what is it that can glue some of those living in the poorest and more marginalised districts to rich white millionaires like Farage and Boris? 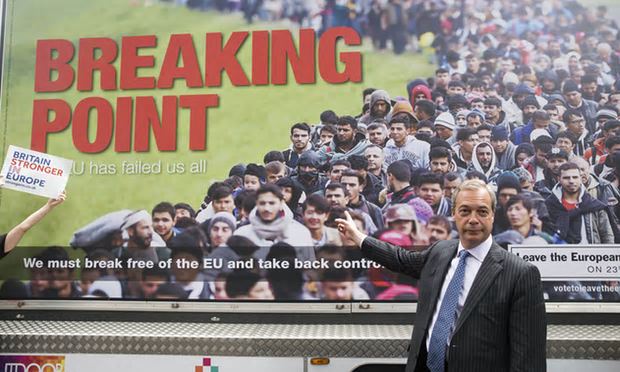 Clearly racism was one of the mechanisms used, in particular by Farage but the answer is deeper than that and quite visible in the Ashcroft polling and the referendum material produced by the Leave side. The answer is in ideology and in particular the toxic ideology of English nationalism, a nationalism steeped in ideas of colonialism, empire and monarchy. Just before the referendum The Daily Mail produced a Leave poster for its windows of a 100m high Norman crusader knight with the St George cross on his shield gazing with hostility out to sea from the cliffs of Dover. His speech bubble reads, “We demand our country back.” When a friend first shared this on Facebook I presumed it was a piss take, but nope it was the real thing. It stands in as a good visual representation of the sort of hyper masculine, militaristic English nationalism that has such a deep hold over English workers, one that has always been used to bind them to their masters. But enough of symbolism, on to some figures about what Leave voters think, 39% of whom are C2DE workers. We can start by repeating the very direct figure that “79% of Leave voters identify as English rather than British”. But the post vote polling gives us a load of information on what voters thought about some key reactionary / progressive dividing lines. This bit of Ashcroft’s polling data is presented in a way that’s easy to misread. It’s not showing the percentage of those who “voted Y who thought X”, it is showing the percentage of people who “thought X who voted Y”. A lot of people have read this the wrong way around, which would make the Leave voters a bloc so reactionary that we’d be talking of a mass actual fascist movement coming into being, thankfully it’s not quite that bad. While there is room for argument around what people might have understood by some of those terms I’m going to say on aggregate that thinking any of these as a ‘force for ill’ is a reactionary position. And of the voters polled, those with a reactionary position were consistently falling on the Leave side in enormous 3:1 and even 4:1 ratios. Again don’t misunderstand these numbers, it's not that 74% of Leave voters were anti-feminists. It’s that 74% of those who identified as anti-feminist voted Leave. Ashcroft is a political pollster that used to do polls for the Tories – hence what seems at first to be a strange way of presenting the data, this is designed to identify blocs of opinion that can be easily mobilised. It identifies people hostile to feminism as a good target group to mobilise for a Leave vote. MORI also did some polling on attitudes to immigration and they presented their data in the more obvious form of how many Leave voters thought immigration has had a bad impact. They found 65% of Leave voters said it has had a bad impact, against only 20% of Remain voters. Confirming that the Leave vote didn’t just attract reactionaries but was also largely composed of reactionaries, at least when it came to the free movement of people. However 19% of Leave voters thought immigration had a positive impact, again a warning that it would be an error to assume all Leave voters were racist, we just need to recognise that some people with progressive attitudes ended up in the Leave camp, perhaps partially as a result of some of the radical Left parties pushing the Leave vote as well, in a de facto Red-Brown alliance. Ashcroft asked those who voted if they thought Capitalism was a force for ill. Leave and Remain voters who thought it was were split about 50:50 (51 to 49 to be exact). In other words we can be certain that neither vote can be considered anti-capitalist, not really a surprise given the choice was between capitalism under Westminster alone or Capitalism under Westminister with some EU oversight. But this lack of difference on capitalism coupled with the extreme differences seen above nail the myth that there was any significant progressive component to the Brexit vote. It’s by far the worst terrain in which to try to build any sort of progressive movement, even if for one rotten moment we’d allow you to throw migrants under the bus for movement building purposes. Now someone might hope these reactionary views were very concentrated in the ABC1 Leave vote but a quick look at the Ashcroft poll data tables suggests this isn’t the case and in fact unfortunately it’s the reverse. If anyone has the time and inclination it would be useful to use his data tables to do a C2DE class breakdown of attitudes. A PDF of his data tables. I’m not going to dissect the Remain vote beyond noting that it also includes some racists, anti-feminists etc. My own perspective is that if I’d had a vote I’d have abstained or spoilt it because although the problem with the referendum was that it mobilised and energised racists the legalistic reality of it is that it offered only a choice between a rock and a hard place. The choice between being ruled from London or being ruled from London with some EU supervision isn’t much of a choice at all. One of the factors that Trump, and Bush before him, were able to use in the US is an entirely fake identification with the ‘common man’ who lives outside the artsy intellectual bubble of New York City. So New England liberals sneering at their way of communicating, or ill informed remarks, became a way of bringing out a reaction from those who felt that they were also being sneered at. Remain commentators seem shocked that Leave votes were concentrated in areas that get the largest EU funding but this expectation of the poor to be grateful misses the that is the reason ‘Take our Country Back’ has such appeal. Again these specific figures are also useful for preventing us falling into the trap of constructing false monoliths. Given the nature of the campaign there were a sizeable number of black and Asian Leave voters. And a substantial minority of whites voted Remain. But in general the Leave voters, including the working class Leave voters, were very disproportionately white in the voter population and even more disproportionately white in comparison with the actual population. Likewise the ’force for ill’ questions do show that Leave was where the mass of reactionary voters were found but not all of them, a quarter to a fifth of reactionary voters were on the Remain side, not that much of a surprise since many, if a minority, of Tory voters went Remain. The Ashcroft polling also confirms that Leave voters tended to be those whose lives have been destroyed by the neoliberal restructuring of the British economy while Remain voters tended to be those who are doing better, or at least expected to. Remain was a 57% majority in the A and B NRS class division, which includes the sections of the working class doing better economically under neoliberal restructuring, and those sections of management doing so well that they are properly part of the middle and ruling class. In general Leave voters were far, far more likely than Remain voters to think that for children growing up in Britain today life will be worse than it was for their parents, and to think that life now is worse than 30 years ago. The gap between the two is enormous on these measures although it’s significant that there is a smaller 2:1 gap when that question is narrowed down to the economic ‘more threats to my standard of living than there will be opportunities to improve it.” In other words, in terms of their expectations Leave voters are 2:1 of those who feel left behind but other fears (i.e. of the influence of immigration, feminism and environmentalism) in addition to the economy make far more Leave voters fearful of the future and nostalgic for the past. This leaves those on the left with a difficult problem. What is a substantial minority of the C2DE working class in England and Wales have taken up a range of solidarity-destroying stances, that amount in total to an ideological link to the right and far right. This in itself isn’t a new problem as that minority has always existed: a segment of reactionary working class opinion that identifies with the Monarchy, Empire and the colonial project. The new problem is that this reactionary minority has been mobilised by the referendum and energised by the result. That has been seen in the events of the days after the referendum where there has been a huge upsurge in both verbal and physical attacks by racist white people on what are perceived to be migrants. Although many feared this consequence the scale of it has come as a surprise. Very often these attacks are based around, or accompanied by, the demand that people ‘go home’, or are from the organised far right groups calling for deportations. In the short term the immediate need is to drive those carrying on these attacks off the streets by physical defence where possible and by mass mobilisations to make it clear that there isn’t a popular licence for racist attacks. In the longer term the left needs to take a lot more seriously the impact the ideology of English nationalism has in creating and sustaining a reactionary core in the working class. Given how deeply it’s rooted in a colonial project of conquest, empire and slavery, there is an argument that English nationalism is of a similar reactionary nature to the confederate nationalism still too common among white workers in the southern USA. This parallel has grown stronger in recent years as racism has shifted somewhere from being expressed based on people’s skin colour to being expressed based on their religion. In case you haven’t noticed the English flag is the same Crusader Cross that the armies that slaughtered the population of Jerusalem and other cities bore as they sought to expel muslims. Past experience shows that intense economic struggle can win over people wedded to such a deeply rooted reactionary ideology, for at least short periods. The orthodox left loves stories of this in struggle and sometimes makes the mistake of thinking repeating them is a solution. But that sort of intense economic struggle has been thin on the ground since the Miners’ Strike and Poll Tax. So while actual intense economic struggle is part of an alternative, the act of advocating it is not in any significant way. What was completely unacceptable was the left versions of anti-migrant rhetoric coming from the Socialist Party leader – this sort of populism doesn’t combat racist views, it simply confirms and entrenches these attitudes. If there is a silver lining to the referendum it is in providing a strong example to the left that it needs to shift from an economistic analysis to an intersectional one. The economistic analysis of parts of the radical left led them to back Brexit as an anti-establishment movement and ignore (or worse, deny) the reality that Leave brought together the most reactionary elements of British society including the most reactionary section of the working class. Doing so involved only focusing on the fact that a significant section of workers were backing Leave and ignoring the views of many of that section, but also the consequences of energising that vote for migrants in the UK, the vast majority of whom did not even have a vote. We must remember these workers are living under a capitalist system where they do not control their conditions of employment. The bosses control the workers and the workers' conditions and they manipulate them in the interests of their profits. The movement of wage slaves from one jurisdiction to another is largely determined by the self interest of multi-nationals and monopolies. Capitalism has since its inception been aware of the advantage of a large pool of unemployed in driving down wages. Is it surprising that a section of the wage slaves think this has a bad impact on them? Freedom of movement of people in a capitalist economy can mean a bad impact. Freedom of movement of people in a libertarian economy can mean a positive impact. In a capitalist economy free movement of people can become a weapon which bosses use to drive down pay and conditions. In a libertarian economy free movement of people means worker controlled enterprises can welcome migrants where and when their work and skills are needed. It's normally roughly 20%. ONS figures for 2015 UK population 65.1 million and approx 11 million children, so 56 million eligible to vote. 44.7 million registered parliamentary electors in 2015 (parliamentary as opposed to local gov electors is a fairly close analog to those eligible to vote in the referendum). This will be slightly changed by the extra numbers registered for this referendum over and above normal - can't find a solid number on this, but 2-3 million seemed to be the figure been chucked around. People eligible to be registered but not would overwhelmingly be C2DE, but can't cite figures for this beyond person experience from work. It's nominally a legal requirement to be registered, and local authorities go to a fair bit of work to try ensure compliance, but in practice almost never take any legal sanction against people who refuse. Your article does not address the fact that those voting breakdowns are of those who voted. Any discussion of this and breakdown of voter turnout would surely potentially change your article and argument a lot. Edited - you do briefly address this point but I do not think your summary and conclusions are correct. If there is a silver lining to the referendum it is in providing a strong example to the left that it needs to shift from an economistic analysis to an intersectional one. Yes moving further to the right and using the lingo of Hillary Clinton is going to defeat ethnonationalist populism. Winning combination. All this is true but the left should still resist the trap of nativism - i.e. where it starts to represent the interests of its 'own' working class over that of migrant workers. If nationalism in general is a problem nativism is toxic poison that destroys solidarity and has to be resisted. Sections of the English left, even the radical left, have been very prone to adopting nativist politics although most often on the level of 'their community' rather than nation. It has to be said the SPEW arguments were an unusually strong capitulation in that regard. It's normally roughly 20%. ONS figures for 2015 UK population 65.1 million and approx 11 million children, so 56 million eligible to vote. Wow thats way, way higher than I'd have imagined. I'd guess its more likely to be higher with C2DEs because of lack of a stake in voting, insecure accommodation and debt avoidance but I guess the still relatively high level of public housing swings that the other way as I'd presume that being in public housing makes registration harder to avoid. Thinking about it though it probably doesn't effect the calculation as the not registered population is a subset of the 'not voting this time' population when the comparison is with the census returns which I'd presume don't have a missing 20%. Someone really should do some number crunching based on the raw data tables as they contain all sorts of additional cross referenced information (e.g. how do people in public housing feel about feminism in contrast with owner occupiers) plus of course the actual percentages who think feminism is a force for ill would be of interest. One tendency seems to be, from a quick glance at geographic results (esp from coastal areas), that the dock areas with long established immigrant presence in ethnically mixed working class areas - Cardiff, Barry, Bristol, Liverpool - voted Remain (as did contentedly mixed inner London) while areas with more recent influx of immigrants such as Boston and Great Yarmouth voted with 40+% majorities for Leave, as did the areas with mainly white populations where there’s often an irrational fear of the unknown dark hordes threatening to invade their precious stagnant 'English/British way of life'. Checking wiki I see "In the 2011 census the Borough of Boston had a population of 64,600 with 15% of the population having been born outside of the UK and 11% having been born in EU accession countries (2001-2011) such as Poland and Lithuania"
I mentioned agricultural work and gangster capitalism running work groups under illegal conditions being a possible issue in parts of the south (I was thinking Kent which I'm somewhat familiar with). Wiki says agriculture is a big thing in Boston, are the same things going on. In the US and southern Europe agricultural work seems to often take a semi illegal super exploited form with any state intervention serving to prevent organisation (among migrants) to fight it. Be interested in the breakdown of BME vote by age (knowing that the overwhelming BME where for remain). The general mood with the old guys on my street of pakistani-kashmiri origin was to leave and with a general moan about immigration and how the West End of Newcastle 'has gone down hill' since the 'romainians' and 'somalis' turned up. One was actually a UKIP guy, the others old labour supporters. AndrewF, have you read any of Felicity Lawrence's journalism? I can only talk to experience in 1 LA (although I believe it's mostly the same elsewhere), but yea, if you don't want to be on it, it's pretty easy to avoid. Each household gets sent 3 letters inviting you to register, then if no reply someone will door knock 2-3 times. Even then if you refuse you're threatened w a fine, but no LA is going to bother to spend the money taking someone to court over it - only exception is if they want a headline case to scare people, but that's incredibly rare. In my LA there was no link to social housing - in fact the relevant department explicitly will not (I don't know if this is a legal requirement) populate data with info from other council sources (council tax, housing etc etc). But it's possible it's one of those weird conditions of tenancy that are increasingly being added to social housing. Even if you're not actively trying to avoid it, especially if you're in insecure housing/busy/don't care/aren't intending to vote, it's fairly easy to miss. I think it's a bit of a dirty secret, as obviously if they were taken into account it massively reduces participation rates in elections. Yea sorry should say, didn't mean it as a refutation, more just a point of info that jumped, out based on personal knowledge! Not that I remember but from reading the first half of that piece that's exactly the sort of thing I mean all right. Andrew, it is an interesting and informative article. Thanks for that. As an internationalist and an anti-capitalist, l couldn't agree more that for workers, the choice between one type of government or the other is not an anti-capitalist choice and will not solve the problems of the class struggle. Nor will solutions that support a nativist approach. That all said, l think there are some arguments the left could make (and we sometimes make) against the EU or at least certain aspects of it, but of course these are more arguments of the sort like if it is better to have a government with some degree of social programs or a totally neoliberal one: neither is what we want, but some policies and practices specifically aggravate the situation. For example, the Euro currency. We are bound by the accession treaty to introduce it, but there is something bad about it since there are big economic differences between some countries but some countries cannot undertake standard inflationary policies since it is not an issue of their national currency. One of course can say that this does not solve basic issues of capitalism, and that's true but it may be very disadvantageous economically. There are also policies and practices that favor certain countries disproportionately, like CAP. The EU finance model, while marketing itself as being "solidary" does little to redistribute wealth, because it caters to the interests of financially stronger and mostly helps with "development" that disproportionally benefits capital. From an anti-statist point of view, one could also argue that it doesn't matter which state rules, but the EU bureaucracy adds layers of government which are often not worth having at all and just cost us more money. As far as the freedom of movement is concerned, it can also be seen that the EU represents freedom of movement for some, but a fortress for others, run by Frontex. Certainly EU accession meant the imposition of new visa regimes and the dramatic tightening of borders where l live. While l am sure that xenophobic crap drove most of these arguments, in particular all the hype about the recent "refugee crisis", there are also other issues. But ultimately you are right that people took out their anger and a worsening economic situation on immigrants because they were pointed in the wrong direction. There is nothing really new about this. What is more problematic for me is that there sometimes is no really good left response to this all - at least not what l see. Anarchists sometimes do a good job, but this has little traction among the general population which usually sees us as a lunatic fringe. I really like this comment, it has really made me think. As can probably be gathered from the piece I'm not at all keen on the way the NRS limited the working class to the C2D (and probably E) categories. I came across the claim yesterday (from R21 I think) that the majority of union members in the UK are actually in the AB categories. Anyone here know if that is correct? A fascinating sociological analysis of the recent referendum in the UK. Top marks, top ranking. According to gov.uk Trade Union Statistics table 3.1 - looks like it, altho depends if "Associate Professional And Technical Occupations" fit under B or C1 - it's using slightly different definitions, so it's not going to match exactly. Even if not, then it's still fairly close. "Capitalism has since its inception been aware of the advantage of a large pool of unemployed in driving down wages. Is it surprising that a section of the wage slaves think this has a bad impact on them? In a capitalist economy free movement of people can become a weapon which bosses use to drive down pay and conditions." "All this is true but the left should still resist the trap of nativism - i.e. where it starts to represent the interests of its 'own' working class over that of migrant workers. If nationalism in general is a problem nativism is toxic poison that destroys solidarity and has to be resisted. Sections of the English left, even the radical left, have been very prone to adopting nativist politics although most often on the level of 'their community' rather than nation. Freedom of the movement of people is, of course, the only acceptable policy. But like freedom of speech both can be used by the devil. We must not forget that capitalism is the overwhelming cause of our social ills.Side issues can seem very important, but we must keep our eye on the ball. Tinkering with the system is not enough. Capitalism is the root cause. In case this is misunderstood, I'm against all nationalism, but I think there are some traps with the whole English as opposed to British identity exressed here. I think with the rise of a civic Scottish nationalism, it has begun to switch, but it is still effectively a British nationalism. It's true that a lot of English nationalists will wave the St Georges flag (itself only used en masse since Euro 96; before then anyone carrying one was almost certainly far right), they generally see it as interchangeable with the Union Flag. Symbols of British identity and English identity tend to overlap, but there are plenty of folk in both Northern Ireland and Scotland who have that British identity. And you should be aware that the use of British as opposed to English in polls etc is usually a marker for ethnicity. You can be black British, but you never hear of Black English. I think that addressing the problem as being principally about English nationalists wedded to an English Empire doesn't make a lot of sense in relation to the Referendum. Parts of North Wales, where English is a second language and there is no question of English identity locally voted to leave. Wales voted by a majority in a higher proportion of areas than England to leave: whatever the reason, it wasn't because they over-identified with English nationalism. The only part of Kent to vote remain was Tunbridge Wells - the richest part and less ethnically diverse than the poorer districts of Gravesend or Medway. This would suggest to me that it is actually more complex than either the narrative of "poor downtrodden workers thumbing their noses at toffs" of the Trots or "nasty ignorant working class racists" of the liberals and I appreciate you've tried to avoid either of those while addressing the fact that the whole "lexit" approach has downplayed racism. It may be that as the Scots further develop their civic nationalism away from Britain and distance themselves from the British Empire, that English nationalism becomes the outlet that British nationalism used to be. There is a lot of support from English right wingers for Scottish independence, but this is mainly because they perceive Scotland as leaving the UK anyway and are hostile to it because it detracts from British nationalism. There is a sense of shock still among many people and I think there is potential for the whole response to the referendum to get interesting. First, thanks so much Andrew for putting in this valuable work, & for everyone else's comments. Especially in the last year I've had an interest in how the electoral rolls (registers, in officialese) are constituted, including who's left off them. I'll comment on both the referendum itself & the electoral register. In pan-class terms, the headline for the referendum result should be: 32.0% out, 29.7% in, 38.3% didn’t vote (making the turnout 61.7%). These figures are unfamiliar because they refer to everyone of voting age, & so include those not on the register. This contrasts with last Friday’s headline: 51.9% out, 48.1% in, on a 72.2% turnout. 7.9m aren't on the register. So how did I get that figure? From the Electoral Commission (ElCo), the relevant quango. In July 2014 it published an estimate that in GB there were 7.5m not on the register at their then current address. It did this by checking the register against the March 2011 Census, its 10-yearly comprehensive household survey. Using much smaller surveys it then estimated that this had not changed by the time it released its Census research. (In fact it noted that the discrepancy had increased by 100 000, but this wasn’t material given that the quantitative exercise couldn’t have been other than an estimation.) This 7.5m is +/- 1.7% for England & Wales, & +/- 0.25% for Scotland. The ElCo estimates were made before GB joined NI in having shifted from household registration to individual registration. The 2002 change in NI saw a sharp drop in the number registered, & this was often interpreted as fair because it eliminated entries which shouldn’t have been there. This is true, but household surveys also consistently showed that an increasing proportion of the enfranchised were not registering - &, as expected, it was disproportionately the young, renters, & poorer people. (The NI report says 34% of C2 people weren't registered at their current address.) Non-registration was both increasing & higher than GB (with its household registration), & it was one reason why the ElCo tried, unsuccessfully, to slow down the government’s push for individual registration. The ElCo is right in having said a few times that it is false to infer that because someone isn’t on the register at their current address that they didn’t vote in a particular election. For example, someone can go to a polling station in that ward or even get a postal ballot sent to where they used to live. Surprisingly the ElCo doesn’t seem to have ever tried to quantify the scale of such voting; also it hasn’t published an estimate - which it must have - of the number of people with such an opportunity. Given the lack of an estimate of people using an old address to vote it is reasonable to stick with the Census-validated evidence & not reduce the 7.9m figure. Even if it were 7m the referendum vote would have been 32.5% out, 30.2% in, 37.3% didn't vote (so -1 percentage point). Finally, the ElCo said 46.5m were registered to vote in the referendum, but I can’t find a figure for those who were eligible by being either Irish or Commonwealth citizens. I made the point about only 32% voting for out & that the most popular view was to ignore the referendum, 38.3%, as part of a letter that was published in today's Weekly Worker. In it I also mentioned Andrew's analysis at libcom. Think of the footage, especially in colour, of the 1966 World Cup final at Wembley. Many Union Jacks, hardly a flag of St George.